Herbs have power. They change health and beauty. In the past such abilities were considered magic. And, those in the know were often considered witches, witch doctors, wizards and the like. That wasn’t necessarily a bad thing. Today, we know the science behind herbal powers. And that may mean ancient herbalists were among the earliest scientists. Regardless, on Halloween it’s entertaining to don an archetypal witch costume and pretend to cast spells on unsuspecting mortals. Year ‘round, nonetheless, real practitioners of Wiccan “religion” use herbs for good. She notes that, throughout the year, “certain botanicals … align with the energies of the season.” During Samhain or Halloween (or the night before All Soul’s Day in the Catholic religion), for example, rosemary symbolizes remembrance of loved ones who have passed. Sounds like a good herb for the season in Christian or pagan practices. “Creative [garden] design is what turns a collection of trees, herbs, perennials and flowers into a garden. The clarity and color schedules found in your magickal garden give focus to your goals and intentions. The complexity in your plant forms, such as texture and pattern will make for a sensual garden that begs to be touched, sniffed and enjoyed. Dugan has me convinced that a little herbal magic may be what people and the environment need. Check her out online. 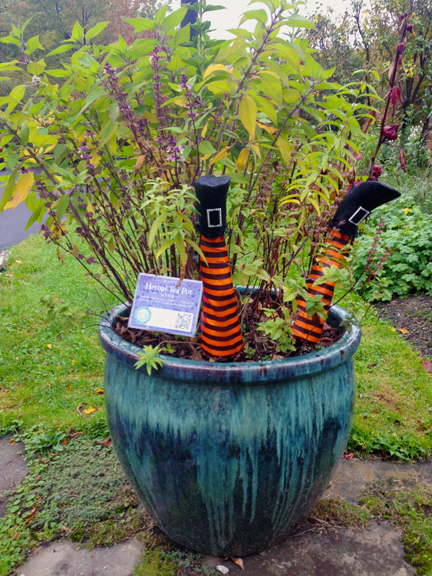 While it’s not herb-based, witches make some of us think about the witch scene in Monty Python’s Holy Grail or three witches chanting in Shakespeare’s Macbeth. Dugan’s latest titles aren’t yet available at Headquarters, but a number of herbal witchcraft titles can be borrowed by request from The Herb Society’s library, via visit, email or phone. They will be mailed and must be returned after 30 days. Non-members can stop by the Herb Society to peruse books in the library.